If you or someone you know has experienced hair loss, you understand that it can cause you to become self-conscious and worried. Know that you are not alone. One in every four women suffer from lost or thinning hair. The most common associated causes of hair loss are androgentic alopecia, chemotherapy treatments and/or other medical treatments, trichotillomania (hair pulling), genetic hair loss, hormone changes, or stress. For females dealing with hair loss, finding the best solution for a specific cause can be difficult and often frustrating. Experiencing thinning hair or hair loss has the power to affect more than just your physical appearance. Hair loss can has a profound effect on a woman’s identity and her self-confidence. Unlike hair loss in men, female hair loss may commonly begin at any age through 50 or later and may not have any obvious hereditary association. Upon recognition of thinning hair it is often undetermined if the loss is going to be temporary or permanent. I.E. if there has been a recent event such as pregnancy or illness that may be associated with temporary hair loss. Until recent, the options for women were limited to hot and heavy synthetic wigs that could be identified as artificial or topical treatments originally intended for male pattern baldness. Hair grafting is a non-surgical process of bonding or integration allowing the wearer to feel that their hair is a part of them and participate in active lifestyles (swimming, gym, etc). Customized per hair loss situation, these hair systems can match any length, color, density and texture; ensuring a natural and virtually undetectable look and feel (SHAVING YOUR HEAD IS NOT NECESSARY). Top pieces like grafted solutions, can often allow for the same coverage of hair loss areas but give you the flexibility to take your hair off nightly. These are often the first purchase in finding your right fit hair loss solution. There are a variety of ways to attach top pieces to your natural hair through use of any combination of sewn in or tape on clips and/or Velcro strips. 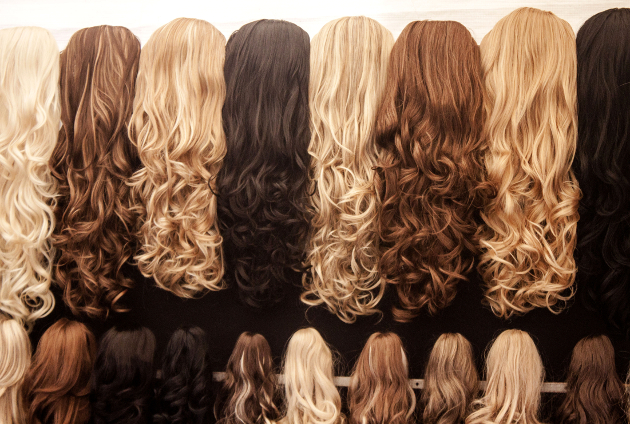 Wigs are also a very viable option for hair loss. There are numerous distributors within the market-space, allowing variety for shoppers. Wigs also can be taken off nightly to extend the life of your hair addition. The largest decisions you will face in choosing your wig will be base construction and whether you want human or synthetic hair. All of these options can be a bit overwhelming for women experiencing hair loss and that’s why we’re here for you. ADR Creative Hair attends hair loss conventions and continued education on a continual basis. We want to be your one-stop shop for any hair loss needs. Please give us a call and will get you on the path to having hair solutions with a complimentary consultation where you are able to see, touch, try on, and feel all your options to make the best educated decision for yourself. Happy Hair Hunting!